I need a user friendly way for non-technical people to reset another persons password in Active Directory. The use case for this is a school where the lab supervisors need the ability to reset a students password without involoving the already overburdened IT staff. - I can't have them going into AD Users and Computers or using a command line. 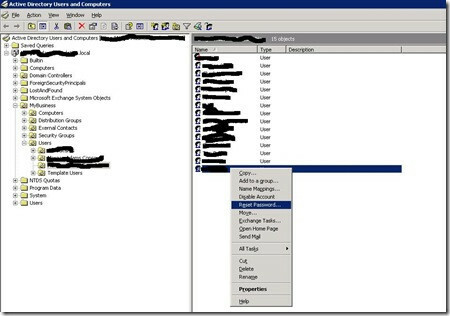 - If the username is entered by selecting from a list, it should only list users in a subset of OUs, and the OU configuration should not be visible to the end user. Is there a tool like this that exists. I found a tool called Password Control, by WiseSoft. It works very well and is easy for users to understand. It has a configuration file that you can modify to enable/disable various GUI controls and default values. It obviously requires the proper delegation permissions that ADUC would require, but it's simpler for a non-technical user to grasp. I believe it meets your second criteria by requiring entering the username and does not allow selecting from a list. I don't recall exactly, as I haven't had to assist anyone after initially training people. If you or someone on the I.T. staff can build asp.net apps, you can build a relatively straightforward website for the lab supervisors to use in resetting passwords. You can also visit here. ManageEngine also makes some pretty useful tools. You might take a look at their ADSelfService Plus software. Not the answer you're looking for? Browse other questions tagged active-directory password windows or ask your own question. Suggestions for using Active Directory credentials (user name/password) with Google Apps? Can i have a 'limited Administrator' for the purposes of unlocking workstations?